In a few online forums I’ve been some getting feedback as I work on Himeko Sutori. Here, here, and here for example. One criticism that I have (and have been bringing up in p much every post in this thread) is about the lack of cohesive art direction. The contrast between the art ingame and the portraits and other elements isn’t nice to look at. 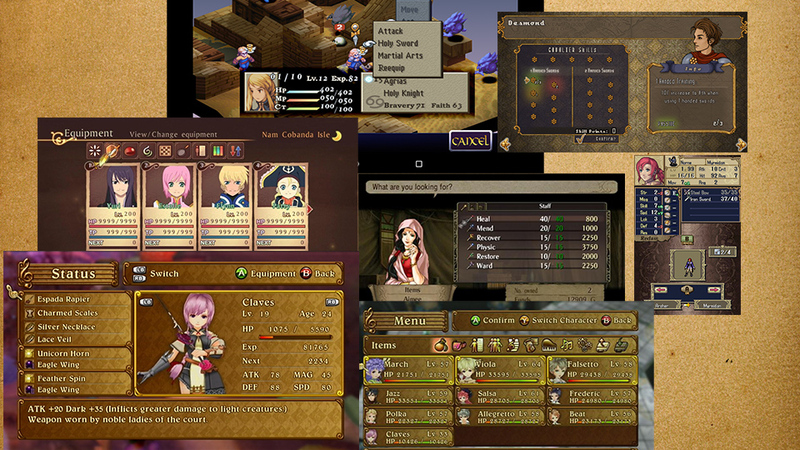 compare the chunky character sprites to the fairly high rez UI, unity assets, particle effects and portraits and it’s like they all came from different games. …I was about to continue that paragraph by saying “I’m not an art director.” But I’ve been trying to avoid phrases like that. Because I am a single developer, now without much funding left to hire other people to contribute elements to the game, I am an art director. I am a sound engineer. I am a technical artist, landscape artist, programmer, web designer, web master, social media director, pixel artist, level designer, 3D modeler, UI developer, and business manager. And I’m trying to get all of the pieces to look right when combined. In the end though, it feels like I can see where the problems are, and I can see what I would like my end state to be, but I’m just not sure what the exact steps are in order to get there. But I’m working on it, and I think I’m making progress. I had World Machine make me a UDK Landscape that was covered in small hexagon-shaped hills. Or rather, they’re actually pretty big hills compared to the size of an in-game character. The blue and white hexagons are the same size as the hexagon cells in previous screenshots. 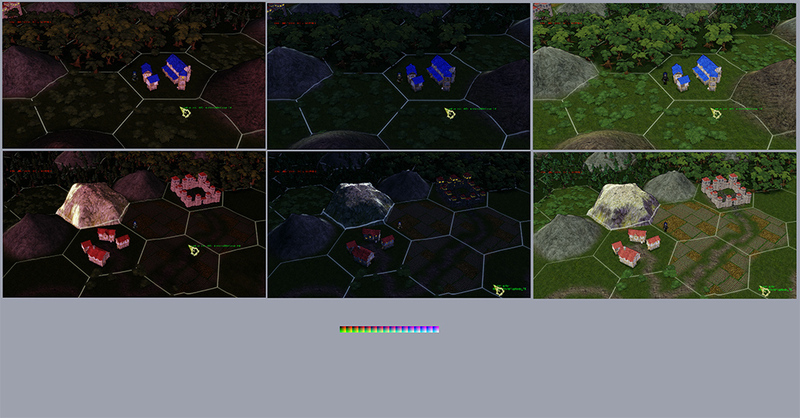 The landscape vertex density is the same as the vertex density in the screenshots above. That map that I had World Machine generate has enough hexes to need 3 days of in-game travel to cross it. 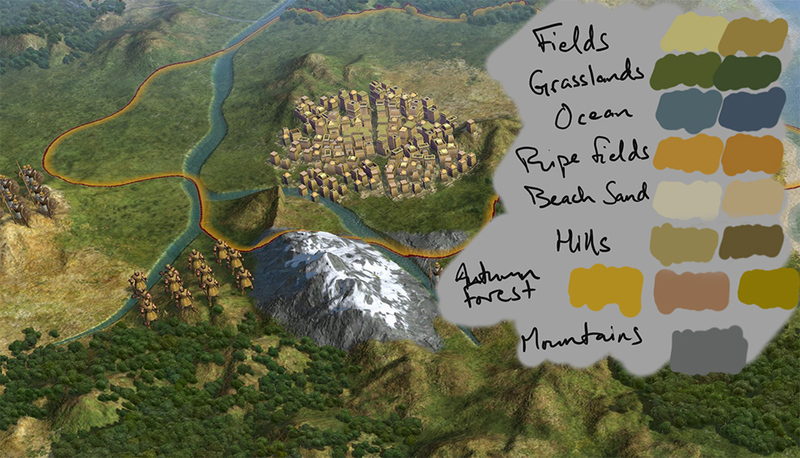 (I figured the player would travel 3 hexes per hour, 12 hours per day, if he doesn’t get sidetracked, get into battles, or travel through rough terrain.) 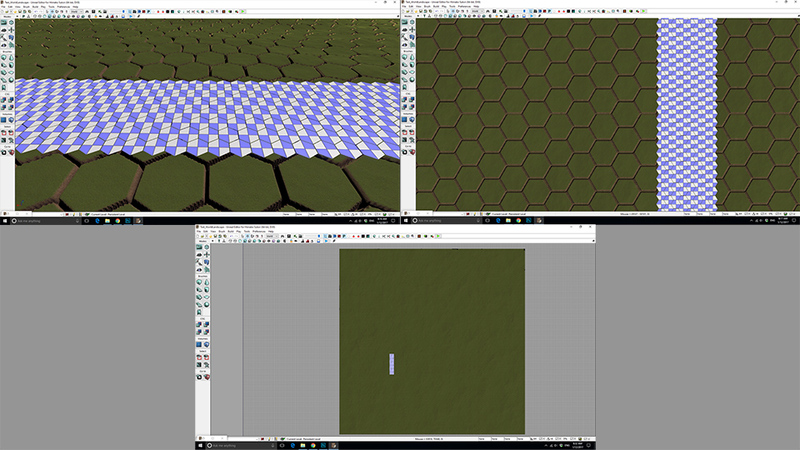 The landscape tiles are exactly 3x too big for the in-game hexagon cell objects. That means that with this size of landscape I can either give the maps 3x the tiles without sacrificing vertex density, or I could give the maps 3x the vertex density (by shrinking the landscape). If I can make this all work the way I imagine it, I’ll be able to crank out prettier levels faster, and have them work with the turn-based gameplay. I’ll write about that later.